In 1838 the City of New Haven celebrated its bicentennial year and the fourth Congregational Church in the area came into being when on November 4th the Chapel Street Congregational Church was organized and declared a Church of Christ with 61 members. This congregation was eventually to become the Church of the Redeemer. Two hundred years before in 1638, the New Haven Colony was settled under the leadership of Reverend John Davenport and Theophilus Eaton who established the First Church, now Center Church on the Green. Gradually over the early years schisms arose and the period of The Great Awakening and the teachings of Jonathan Edwards led to the formation of dissenting groups such as the White Haven Church and the Fair Haven Society. These two groups merged in 1796 to form North Church on the Green, the Second Church of New Haven, now known as United Church. The Third Congregational Church was formed in 1826 under the leadership of Dr. Nathaniel W. Taylor, a Professor of Theology in Yale College and a former pastor of Center Church. The founding members of the Third included 19 from Center Church and 10 from United Church. This congregation was disrupted after a new pastor, Dr. E. L. Cleaveland, who was installed in 1833, would not accept the "new theology" of Nathaniel Taylor. Many members of Third stood by Dr. Taylor and under his spiritual guidance organized and founded the Chapel Street Congregational Church. At the organization meeting Timothy Dwight, Jr., son of the President of Yale, acted as Chairman and became very active in the government of the new church. During the over 170 years of our history, there have been 17 Pastors of whom the longest serving were Reverend John E. Todd 1869-1890 and Reverend Watson L. Phillips 1890-1915. Both were serving during the two major relocations of the church. 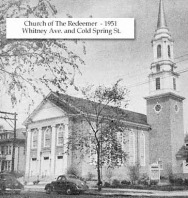 Todd was present when our Second House of Worship at Orange and Wall Streets was dedicated on May 25, 1871 and the name changed to the Church of the Redeemer. 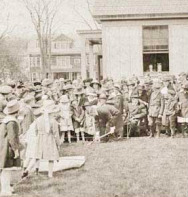 Phillips was involved in the move to Cold Spring Street and Whitney Ave where the Parish House was dedicated on October 10, 1920. After 30 years of planning and fund raising the present Main Sanctuary was completed and dedicated on May 20, 1951 during the pastorate of the Reverend Robert E. Luccock.